The Jerusalem Temple and the "End of the World"
Most Bible students disparage the significance of the Jerusalem temple and its destruction. This is a gross failure to understand the symbolic significance of the Temple in the Jewish mind! In several formal public debates, my opponents have totally disparaged the significance of the destruction of the Jerusalem Temple in AD 70, arguing that “it was just another Jewish city that was destroyed” and most of the ancient world could have cared less, most especially the Gentiles. See my debate with Mac Deaver, Amillennialist, that was held in Carlsbad, NM, in 2008. Contact me to order a copy of this debate in MP3. Kenneth Gentry correctly appraises the symbolic significance of the Jerusalem Temple in regard to Israel and their covenantal relationship with YHVH: “In essence the temple itself is a symbol: it symbolizes the covenantal relationship of God with His people. The heart of the covenant appears in the most important promise: ‘I will be your God, you will be my people. The temple is the special place where God dwells among His people” (Kenneth Gentry, He Shall Have Dominion, Draper, VA., Apologetics Group, 2009, 362, his emphasis). “The end of the temple and the end of the world are not unrelated events, according to Jewish and early Christian thought. The temple, both in the OT and Second Temple Judaism, symbolized the cosmos.” Much of the architecture and artistry employed in of the tabernacle and the temple’s design point to an embodiment of the cosmos. For instance, the molten washbasin is called “the sea” and the altar “the bosom of the earth. (1 Kings 7:23-26). The twelve bulls supported the washbasin were divided into groups of three, each group faced on direction of the compass (1 Kings 7:25, thus signifying the four corners of the world. The seven lamps on the menorah are referred to as ‘lights” (Exodus 25:6; 35:8;, 14, 28; 27:20; 39:37; Leviticus 24:2; Numbers 4:9) by the Hebrew word which besides the sanctuary lights is used only in reference to the ‘lights’ spoken of in the fourth day of creation, where the sun, moon, and stars are also called ‘lights.” The seven lights were also seen as representing the five known planets as well as the sun and moon. Josephus and Philo both saw the temple as a symbolic microcosm of the cosmos….. “If Mark recognized the temple as a microcosm of the world, then the end of the temple could not be disassociated from the end of the world– at least not symbolically. Indeed, what better symbol for the end of the world than the demolition of its prototypical representation? This would explain the reference, in the midst of the discourse, about the temple’s destruction, to the end of the world. Although these two events seem unrelated to our modern sensibilities, they may well be closely associated within the milieu of first century Judaism” (Timothy Gray, The Temple in Mark, (Baker Academic, 2008)148f). Josephus, Ant. Bk. 1, chapter 7, 7 (p. 180-181; also see 90-91) – Josephus says that the Temple and even the garments of the priest represented land, sea and heaven. When we honestly consider this Jewish concept of the Temple, it is little wonder that when Jesus predicted the destruction of that City and Temple, the disciples immediately connected that impending disaster with the “end of the age!” In their mind, and from prophecy, the two events were most definitely linked (See Daniel 12 and my YouTube video on whether the disciples were confused, or simply wrong, when they mentally linked the coming of the Lord and the end of the age with the destruction of the Jerusalem Temple). 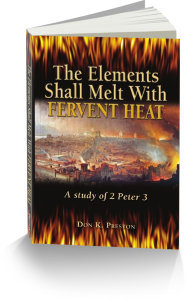 See my book, The Elements Shall Melt With Fervent Heat, for a fuller discussion of how the first century Jews viewed the City and Temple. It behooves Bible students to better understand these issues. To the Jewish mind, the Jerusalem Temple was far, far more than just another city, or just an ancient Temple, it was their world! This book provides a wealth of information on how the ancient Jews viewed the Jerusalem Temple. It was “heaven and earth”! Excellent article, spot on exegesis of the relevant passages. You certainly have a gift for making complicated concepts understandable. 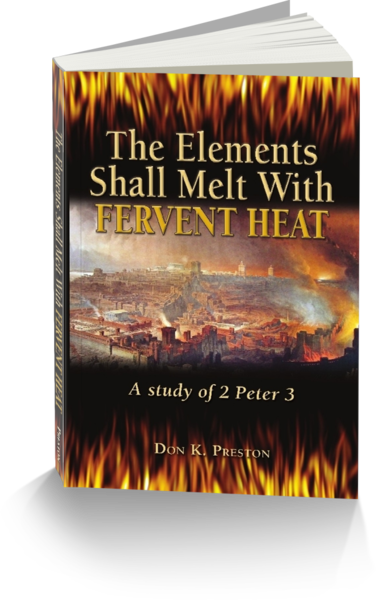 The problem that preterism faces is that the average Christian today reads books about the Bible instead of reading the Bible for themselves. You compare Scripture with Scripture and show how the Old is fulfilled in the New. May God bless your work on His behalf. Previous Previous post: The True Israel of God| Who Are “The People”? Next Next post: Debate with “Ask Dr. Brown” Coming Up!